I'm a few days late with this. Father's Day was June 20. The sentiment expressed here, however, is enduring. Reprinted from another blog with the permission of the author. Pauline -- I can't remember if I've asked you this before. 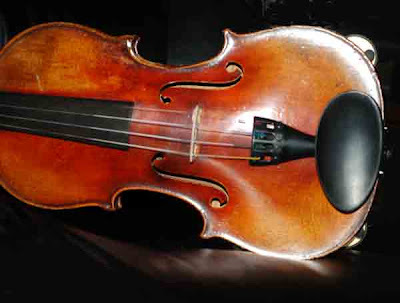 I'm just a bit curious -- do you know if your violin is one of the turn-of-the-century(ish) "conservatory violins" that were imported from Germany and France for the student market? My older violin is German, and has the words "Conservatory Violin" pressed into the wood on the back of the scroll. The word "conservatory" arches (like a rainbow). The word "violin" runs straight across the scroll, underneath "conservatory". These instruments were imported in great numbers, and were usually mail-ordered from firms like Sears & Roebuck and Montgomery Ward after they'd reached the U.S. When I acquired my violin, it was in great need of repairs and replacement parts. My luthier has worked miracles on it, and it sounds absolutely wonderful!!! Marsha, my violin does not fit your description of a Conservatory violin. I don't think it was made for student use. As I said, my teacher, a professional violinist, played it before I did. Since I've owned it, it has never required any serious work by a luthier. I really love its sound. Barry and Anne-Marie, I'm glad you enjoyed the story. Yes, my father did some wonderful things for me.